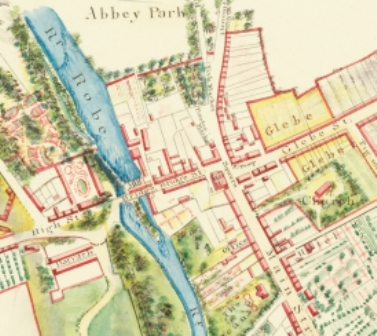 During an interview relating to the launch of the book "Ballinrobe - A Visual History" Gerry Glennon, of Mid-West Radio asked about the image of a trade directory of Ballinrobe's businesses in 1824 (p 33). He listed out quite a few of them and it was this that sparked the first seed of the idea. So many of these businesses were no longer in existence; I wanted to bring this part of our heritage to life. I walked around town to see what now stood on these sites and was surprised at the number of vacant business premises; our recent Celtic Tiger heritage. The question was how to connect the old with the new and suddenly the idea was born, a Pop-up Museum. This might bring the vanished past to life through the use of vacant, blank windows. 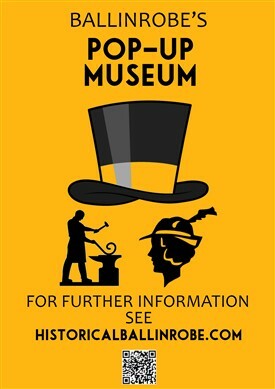 The Pop-up Museum dioramas, consisting of illustrated boards with some artefacts, were created to enhance Ballinrobe’s status as an important Historic town, contribute to its overall appearance and promote its heritage as a marketable commodity. The aim to inspire, create dialogue and empower the local community is an integral part of my desire to appreciate this visually attractive place, acknowledge its strengths and remember the communities who have gone before us; their legacies remain all around us if we care to look. 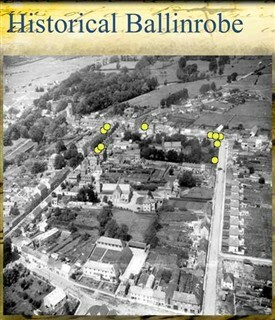 Drawing on information from other trade directories and newspapers from the late 18th/early 19th centuries, this first phase, covers a selection of trades/business/events in the town, bringing a flavour of Ballinrobe’s colourful past to life and using some of our temporary ‘vacant window spaces’. We hope this exhibition it will inspire viewers to dip into their own histories, memories and empower them to share their stories; why not leave something behind for future generations? Artefacts relating to the trades/locations are being added to the collection; a full list is available below. We would like to thank the owners of premises, who generously allowed the use of their widows for this project. Without the help of the South West Mayo Development Company through Christine Mannion, Supervisor Rural Social Scheme and Trevor Grimes, Supervisor Tús, who supplied finance and man/woman power and without whose assistance, this project would not have been possible. Thanks also to Marta Dembinska for her excellent work on the graphics. The current boards are placed on Main, Glebe & New Streets at the locations indicated on the map. This page was added by Averil Staunton on 23/01/2014. Congrats Averil. Have been very impressed with these Information displays. It is a lesson for other Mayo Towns to engage with.